Similar to the other Setter hounds, the Irish Setter is an exceptional hunting dog. They are rather energetic and very playful canines. Calm and friendly toward other dogs and strangers, they make an easy fit into any home setting. They are pleasant dogs when given the freedom to run and play as they were born to do. If they do not receive this type of time and space to exert themselves, they may become easily irritated in a home environment all day long. They do have a tendency to get a tad overactive to be at ease around very young children, but overall have a less aggressive demeanor than the other Setters. The Irish Setter is a very active hound, which will equate to needing an active family or owner to reside with comfortably. They need to move around by running, or even playing catch for at least an hour each day. With the amount of energy they posses, being natural hunting dogs they will not be suitable for residing in a small space such as an apartment. They do possess the ability to have their lifestyle indoors or out, but will need to be placed indoors for overnight sleeping arrangements when the climate is cold. Irish Setters are great for mingling and can be very at home interacting with people. Grooming their coats will need to be completed twice per week. 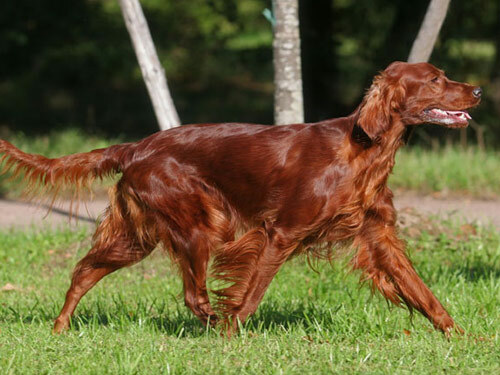 Irish Setters are natural hunters, making them more susceptible to developing injuries due to the tremendous amount of running and climbing they do continuously for years. Running into other health concerns such as an overactive thyroid, megaesophagus, panosteitis and HOD. In very scarce situations, an Irish Setter may come across an episode with epilepsy, hemophilia A or OCD. This type of OCD is not the human form commonly known as an obsessive behavior characteristic, this type is of joint damage generally effecting the shoulder in dogs, but can also effect the knees and elbows as well. Irish Setters usually have a healthy lifespan of twelve to fourteen years and they do have testing available currently to locate if the PRA condition is present in the parents before the breed is effected by it. The Irish Setter derives from the Pointer family of dogs, originating from Ireland. In the 1700’s, they were known as the Irish Red Setters until they landed in the United States. The kennels began to fill with Irish Setters in the 1800’s, with many fans for their red, shiny coats. It wasn’t until 1862 that one Setter would transform the breed with its thin physique and elongated neck, named Champion Palmerston. From its original owner actually ordering Champion to be drowned, it was thankfully intercepted and he went on to become a successful show hound. It was as a result of a one Champion the Irish Setter that the breed went from a hunting canine to an aesthetically pleasing show dog. While they have been noted as tremendous hunting and bird setting dogs, they are also growing as show dogs also. They are currently common family dogs and very affectionate.